Most Missourians are cool with voter ID laws. They approved it on the 2016 ballot. Clearly, they think it's fair for officials to ask for identification at the polls. 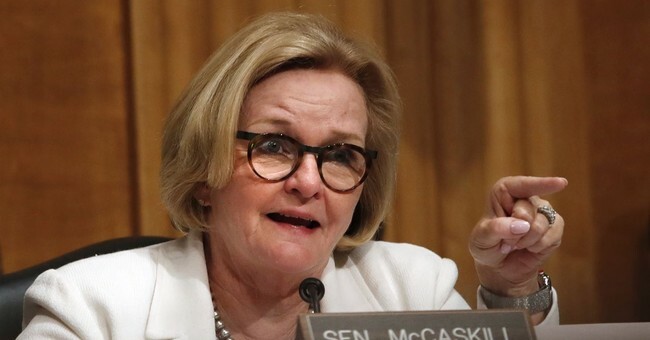 Still, that didn't stop Sen. Claire McCaskill (D) from charging that voter ID is racist at its core during a dinner with the NAACP. "There are people that are still trying to figure out ways to keep folks from voting. It’s happening right here in Missouri," McCaskill said at at the 2018 St. Louis County NAACP Freedom Fund Dinner in St. Louis. "It’s happening right now. We have a lawsuit that is being brought against the voter ID law - and by the way, we all know there have been no complaints of people fraudulently impersonating someone to vote in Missouri - none. But the voter ID law is designed to do something pretty insidious: it is designed to disenfranchise people who have the most difficulty navigating bureaucracies, who have the most difficulties sometimes proving where they were born because their families weren't allowed to have their baby in a hospital because of the color of their skin. So we are going to fight this voter ID law and I got to leave you with this - before I introduce my friend - if we do not succeed in court, there is another way we can succeed and that is by deciding that this year is the year that all of us do that extra something to register voters, educate voters, and make sure that every single voter who shares our values has that opportunity to vote." McCaskill went on to remark on the law's sinister design. "But the voter ID law is designed to do something pretty insidious: it is designed to disenfranchise people who have the most difficulty navigating bureaucracies, who have the most difficulties sometimes proving where they were born because their families weren't allowed to have their baby in a hospital because of the color of their skin." In 2016, 63 percent of Missouri voters approved a voter ID law that required voters to show a photo ID. Opponents, however, called it "Jim Crow." Progressive groups like Priorities USA have been challenging the law in court.